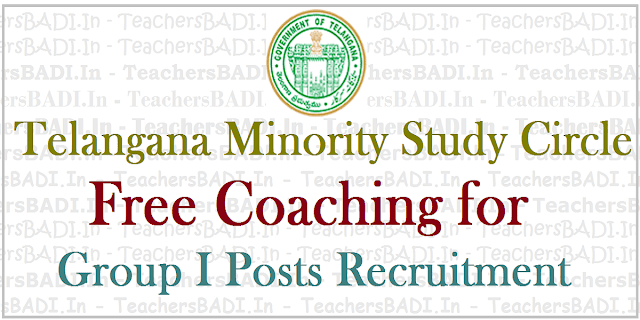 TSPSC Group I Posts recruitment Free coaching admissions @TS Minority Study Circles 2019, Telangana Minority Study Circle TSPSC Group 1 posts Free Coaching Programme 2017, Online Application form, Last Date for apply, Exam Date, Free Coaching for TSPSC Group I services recruitment, Free Coaching for Competitive Exams, Admission Guidelines, selection process of the candidates for the coaching Programme, List of Documents for Uploading and Financial Assistance details are given here. 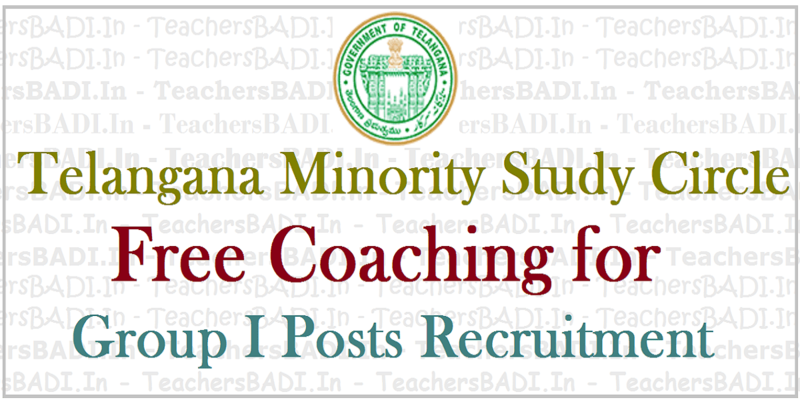 TS Minority Study Circle free Coaching for Group I Posts Recruitment: Government of Telangana, Minority Welfare Department has issued Free Coaching Notification for Recruitment of Group I Vacancies. The TS Minority Study Circle invites the Online Applications from the eligible candidates belonging to Minorities for free coaching to Group I Exams. Eligibility criteria is Graduation from any university. The coaching programme for the registered candidates will be conducted in Telangana Minorities Study Circle, Hyderabad and sub centers of the Districts. Aspirants are advised to register their applications online through ww.msc.telangana.gov.in Last date of receiving online applications is ..
1. Candidate shall have the educational qualification which is eligible for appearing Concerned jobs. 2. The candidate’s family income shall not exceed in urban area 2 lakhs and in rural area 1.5 lakhs. 3. The seats are allocated to the candidates of different categories i.e.,. Muslims, Christians, Sikhs, Jains, Buddhist and Parisians as per norms in vogue. 4. Free coaching seeking Candidates must be belonging to state of Telangana only. The selection process of the candidates is based on either on Merit or Marks Obtained in the Screening Test conducted by study circle. (2) Photograph, E-mail, Address, Mobile Number in the given website etc. Aspirants are advised to send their applications through online www.msc.telangana.gov.in or in person/ or through postal as per schedule. The coaching program for the selected candidates shall be conducted in Minority Study Circle, Hyderabad. The selected candidates shall submit their original documents at the time of admission and they will be retained by the Study Circle till the completion of their coaching. E-mail id: director_msc@telangana.gov.in Ph: 040-23236113. Last date for Submission of Online Application Form:..